CN6201 Series are in the end of life cycle. As a possible substitute & upgrade, please check out Newest Released 16 DIN Dual Display PID Controller CND3 Series for more advanced features with better price. 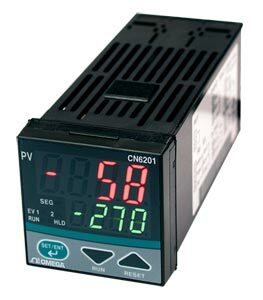 The CN6201 Series temperature controllers have 1 program pattern consisting of 16 segments that can easily be set and operated. The 2 event outputs are provided as standard. External contact input, RS485 communication and retransmission outputs are optional. The universal input supports thermocouple, RTD and voltage input types and the 3 types of outputs. The front panel has a splash-proof and dust-proof design (IP65). Output Signal: Measured value in 4 to 20mAdc can be scaled. Note 1: The primary terminals are the power supply terminals and event output terminals. The secondary terminals are the analog input and output terminals, the voltage pulse output terminals, and the contact input terminals. Note 2: The withstanding voltage is specified as 2300 Vac per minute to provide a margin of safety. Note 3: AC/DC 24 V terminals are secondary terminals. 참고: Comes with complete operator’s manual.